Prostate cancer is one the most commonly diagnosed types of cancer and testosterone-blocking drugs, such as Lupron and Casodex, are often prescribed for it. However, conventional medicine has NOT had significant success curing prostate cancer, especially once the cancer has metastasized, and this is largely because of some common misunderstandings about the PSA and testosterone that have propagated throughout mainstream medicine. These misunderstandings should have been challenged and abandoned decades ago. But since they weren’t, men with prostate cancer need to educate themselves and gain a better understanding than their doctors. First, here are some basics about prostate cancer. For most of the past century, prostate cancer occurred primarily in older men and was slow-growing in most cases ¾ so slow-growing, in fact, that men over 65 could often simply live with their cancer without receiving any treatment at all. This was because they had a good chance of dying of old age before dying from their cancer. However, according to cancer treatment specialist, Dr. Contreras of the Oasis of Hope Hospital, recent years are showing more and more cases of aggressive (or fast-growing) prostate cancers being diagnosed. Men at younger and younger ages are developing prostate cancer and the younger cases tend to have a higher incidence of aggressive forms. (4) Hormone Therapy (hormone-blocking drugs). The surgical option involves removal of all or part of the prostate gland. This may sound good at first, but it is often an imasculating procedure with a high likelihood of some degree of impotence occurring as a result. Also, some men experience difficulty holding their urine post-surgery. Radiation also sounds powerful and may seem to be a good option, but can actually causes localized prostate cancer cells to mutate into more aggressive forms in some cases and provides no curative benefit once the cancer has metastasized. Unfortunately, chemotherapy has no long-term curative effect on prostate cancer, either, in most cases ¾ especially once the cancer has metastasized. That just leaves hormone-blocking drugs, and this is where the MOST ludicrous and dangerous misunderstandings occur in conventional prostate cancer treatment. One of the biggest fallacies in mainstream medicine is the idea that blocking testosterone will inhibit the growth of prostate cancer! There is no actual proof that blocking testosterone inhibits prostate cancer growth. There is only proof that it lowers the PSA count in most cases. (I’ll get to that next.) Moreover, prostate cancer has always been much less common in men between the ages of 18 and 25, which is when testosterone levels are typically at their highest. In fact, years ago, prostate cancer was virtually never seen in younger men at all and is only being observed now in young men because ALL types of cancer are showing up at younger and younger ages. You would think that, if testosterone does in fact feed or promote prostate cancer in any way, then we’d have always seen the highest rates of this type of cancer in younger men. Common sense tells us that testosterone is not the culprit, but we don’t have to rely on common sense. There is plenty of scientific evidence to back this up, which I go into detail about in Chapter 20 of my book. The really sad thing is that, not only does testosterone NOT promote prostate cancer, but lowering testosterone activity in a man always causes the man to become estrogen-dominant, and estrogen-dominance always promotes cancer growth! If you don’t believe that hormone-blocking drugs cause estrogen-dominance, just look at the common side effects of Lupron and Casodex. Englarged breasts, hot flashes, and reduced libido are all signs of estrogen-dominance in a man. So, why do doctors think that blocking testosterone will reduce cancer growth? Well, it’s because artificially reducing testosterone, does reliably make a man’s PSA count go down. So, that’s good, right? Wrong. A man’s body uses testosterone to make PSA. It’s like needing flour to make a cake. No flour, no cake. Likewise, reduced testosterone, reduced PSA count. The sinister problem is that oncologists have never been taught this concept, so when they give a man Lupron or Casodex and see his PSA count go down, they think that means the cancer is going away. It doesn’t. It just means that the man’s body does not have enough flour to make the cake. It’s as simple as that! Plus, both testosterone and PSA have properties that actually help a man’s body fight the cancer. So, by not allowing his body to utilize the full amount of testosterone and PSA he is able to make, and by making the man estrogen-dominant, the medical system is actually promoting cancer growth in men with prostate cancer. It may be time for men to ‘just say no’ to hormone-blocking drugs. And it may also be time for a fair evaluation of the true effectiveness of conventional prostate cancer treatment versus the much more effective non-toxic options that are available in the world of alternative medicine ¾ options that CAN even cure advanced metastasized cancer in many cases. 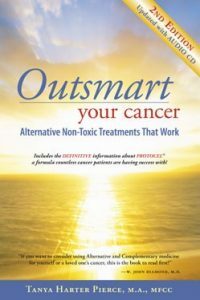 For a more detailed explanation of how testosterone and PSA function in regards to prostate cancer, you can read Chapter 20 of my book, OUTSMART YOUR CANCER or go to my website and blog at www.OutsmartYourCancer.com.